Anybody can pick up an acoustic guitar and sing sensitive love songs, or sappy ballads about trees and forgiveness and rainbows. Singer-songwriters are a dime a dozen. So, if you want to be musically minimalist and still impress me, you better be ultra-creative or just completely tortured. 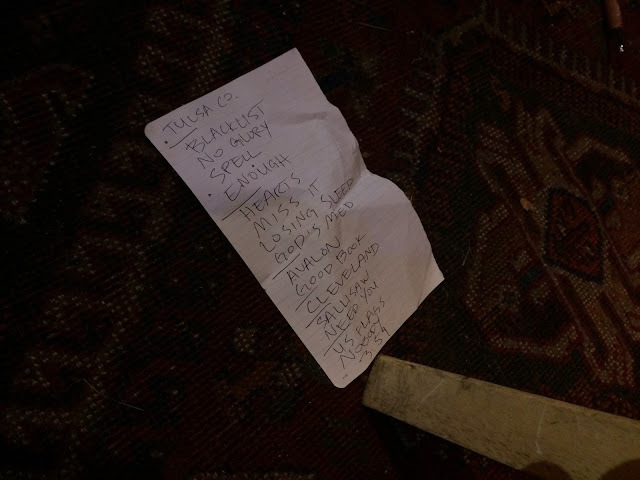 Because there's already enough acoustic wuss rock in the world, and the sign-up list to play Joe's Java Hut on a Wednesday stretches from here to the nearest farming co-op. It's filled with hipsters wearing denim. Standing out from the guitar-carrying masses takes something special. You have to crush your audience with lyrics. And they need to believe you. Right now, nobody is doing that better than John Moreland. 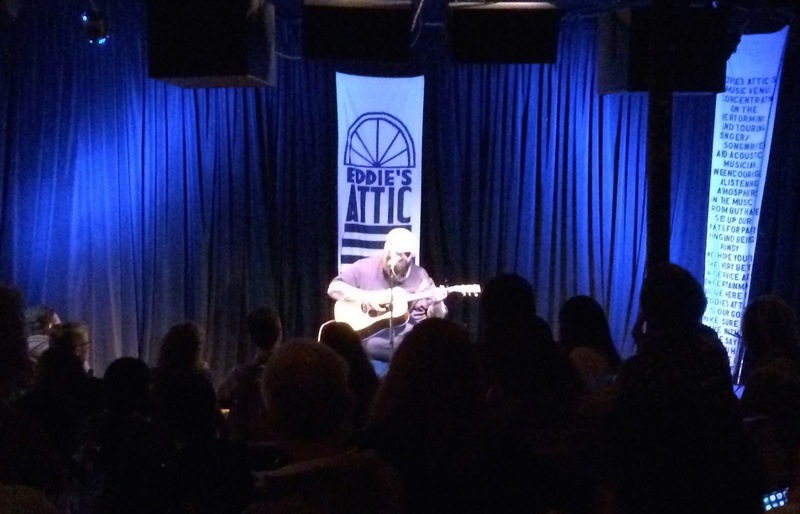 Eddie's Attic is a locally-famous listening room in Atlanta. Emphasis on listening. When you're at Eddie's, you're there to hear the music and not to yap about how Sam isn't fulfilling your relationship needs and, OMG, did you see Jimmy Fallon last night? It's a respectful venue. Quiet. Polite. Decent food. Good beer. And on this particular Thursday, well-sold for an early show. Shortly after the opening act, I was filtering back to my seat from the bar when, right in front of me passed a large, bearded man - his arms covered in tattoos - walking slowly from the back of the room and onto the stage. He didn't have the aura of a headliner. His blue jeans were falling down as he propped himself on a stool, rested his guitar over his gut, and, with zero expression, softly spoke into the microphone, "Hey, everybody. I'm John Moreland. Here's some songs I made up." The Oklahoman almost looked sad to be there. A tortured soul. Perfect in every way. Fantasy and fear. Hope and heartache. Dreams and doubt. To witness Moreland's physical presence in person is to, perhaps, gain a slightly more meaningful understanding of the emotion and conflict in his music and the duality in his heart. For this seemed like a man who's battled personal demons. And, if nothing else, the man on stage clearly wasn't manufactured from scratch, carefully pieced together in some executive boardroom. If there's one thing this performance proved, it's that you can't fake pain. And you can't fake truth. Moreland opened his set with "Hang Me in the Tulsa County Stars," the first track off his new album "High on Tulsa Heat." It's absolutely beautiful, and gut-wrenching when he sings, "My heart is growing heavy from the ever endless hurt, so I don't wanna come back down to Earth." My friend and I glanced at each other with the same look that said: Buckle up. Our hearts are about to get ripped out. And Moreland didn't let up. The first ten-or-so songs all washed over you with pure emotion. In "Blacklist," for example, he wails, "Just tell me you don't love me, and I promise I won't darken your doorstep again." I momentarily considered plunging my dinner fork into my chest, but decided to at least wait until I was done with my food before ending it all in public. So, I continued to enjoy the pain as Moreland stepped on my face with "Heart's Too Heavy," pushing down hard with his heal when he sang, "I can pin down the minute that I lost my buzz. Thought I was somebody that nobody could love." These lyrics resonate just as well in your iTunes, but seeing Moreland in the flesh takes everything to a new level. It proves that he is real. The mood only changed when Moreland finally broke into an upbeat blues song called "The Good Book." The crowd, perhaps needing a release, seemed to dig on this one. Once we're on that long, bumpy ride down the road of despair, I've got no time to pull over and feel good. Just lay it on me, brother. That's why they make whiskey. For the rest of the show, I sat back and let the man destroy me. Besides the one or two upbeat songs that, for me, just didn't resonate, there wasn't really a miss the entire night. It was as near a flawless one-man show as you'll ever see. The pain just kept coming. "You Don't Care For Me Enough to Cry" stood out with, perhaps, the most gut-wrenching line of all as Moreland sings, "I'm the kind of love that hurts to look at." Read that line again: "I'm the kind of love that hurts to look at." Words like that come from a dark place. A similar highlight emerged from "Losing Sleep Tonight." It was pure emotion. "Bury me in a box with my mistakes, 'cause this lonely room's a prison, and these fictional women, they fade away the longer I'm awake." Give me a thousand years and I won't come up with a brokenhearted line like that. At best I'll manage something about slow wi-fi. The other standout performance of the night was "Nobody Gives a Damn About Songs Anymore." It's a catchy tune that aptly sums up Moreland's career, and his unusual place in the modern landscape of American music. Make no mistake. Up in that fancy boardroom, bad people in good suits are piecing together the next pretty face to dominate pop music. They'll turn the truth to zero and the auto-tune to eleven. Yet, here was an artist - a genius - pouring his heart out. And, somehow, there were still tickets at the door. 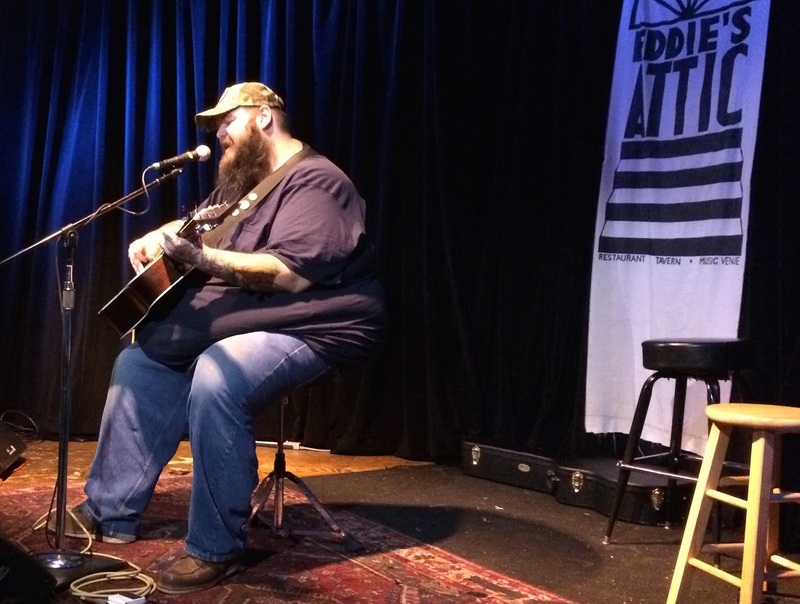 If there is justice in this world, John Moreland will get far more than his due. We're talking about one of the finest contemporary male songwriters alive today. He's up there with Jason Isbell, Dave Rawlings, and Todd Snider. And to go with all the words, he's got a voice that sounds like Bruce Springsteen and Tom Waits had some sort of love child. It's a voice like that doesn't lie. 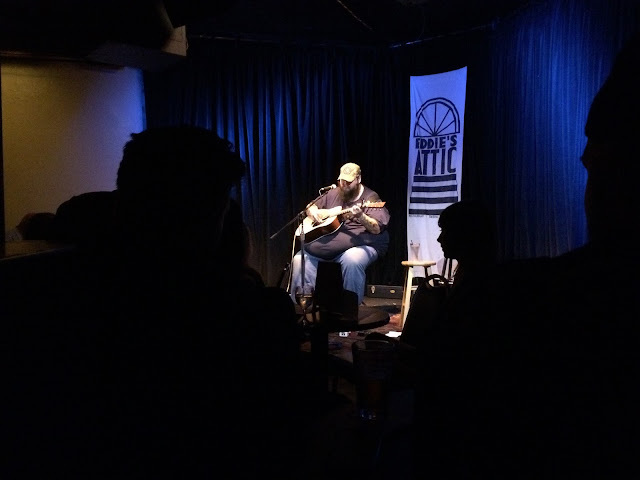 To see John Moreland in concert is to submit to the truth. And to darkness. And to light. Which is why it sort of seemed appropriate that he closed the show with a cover Springsteen's "Thunder Road." "You ain't a beauty, but hey you're alright." 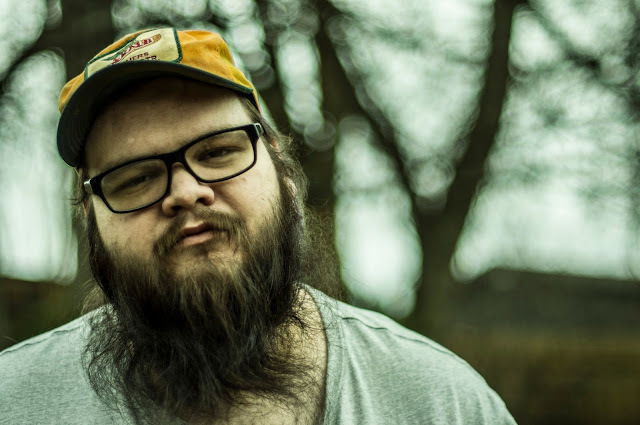 * Special thanks to Andrew Iden for turning me on to John Moreland. How is this guy going under the radar - including mine? I was lucky enough to catch the big man last year in Chattanooga. Your review is spot on. Intimate. Painful. And beautiful. Won't be long until he starts playing big rooms. Glad you got to see him!